Nancy Herd, Good Shepherd Lutheran Church in Chattanooga, recently accompanied her husband Cliff, on a month long trip to Tanzania. While he was teaching a deacon class she worked at Nakato Clinic run by International Health Partners of TZ a partner of the East of Lake Victoria Diocese (ELVD) . Nancy was given the task of sorting over 3,000 pairs of eyeglasses that had arrived in many boxes via a large shipping container. She classified them according to male/female designs and by lens strength. She used discarded cardboard boxes and arranged them so they could be easily dispensed. 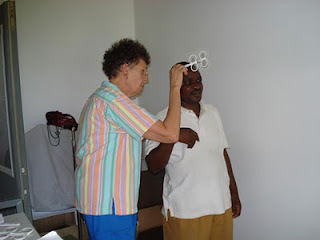 She tested the vision of all the deacons and their wives and also saw another 200 people that came to the health center from the village. Nancy brought a set of 5 “flippers” for vision testing and trained a nurse who works full time at the health center to use the “flippers” and dispense the glasses. “This was a most rewarding mission trip as we both felt we were serving our Lord and helping make more and better disciples for Jesus. What a blessing to serve in this area of East Africa and see how the Lord is growing His Church,” said Pastor Herd. God can also use your gifts and talents in Tanzania. Contact the District office to find out how your talents could be used.